Explore & build on innovations with a global community. Participants share their submissions openly, and others may view and give feedback. How might we harness technology to bring quality immunisation services to mobile urban populations, reduce outbreaks and improve primary healthcare? Let's harness technology and innovation to connect urban populations to immunisation services. Clearly articulate an answer to the Challenge question. Address a problem that is pressing and real by articulating the gap this idea is filling. Demonstrate an understanding of the needs of intended beneficiaries. Through the INFUSE 2019 challenge, selected innovations will be invited to join the INFUSE Community—an ecosystem of leading innovators, corporations, and development partners tasked with collaborating together to bring greater innovation to the immunisation and global health space. Read the full Brief, and dive into the Challenge. Submit an innovation before April 10th! Check out our resources meant to support your participant experience. As global population demographics evolve, skewing rapidly towards urban and peri-urban settings, routine immunisation programmes need to adapt with specific interventions tailored to reaching every child. The growing number of people living in urban areas has brought new challenges for gathering data, planning and communicating—as well as opportunities to develop new approaches to routine immunisation. Immunisation connects the vast majority of families with the primary health system up to five times in the first year of a child’s life—more than any other health intervention. As a result, strengthening immunisation services in complex and dynamic urban settings also allows for a fortification of access to primary healthcare more broadly, and enables robust pathways towards achieving universal health coverage. Header photo credit: © Asad Zaidi, Gavi, 2017. Inline photo credit: © Rachel Belt, Gavi, Jalousie, Port-au-Prince, Haiti 2016. The Submission Phase is more than just a call for proposals. At OpenIDEO, we believe that new and existing ideas become better through collaboration, transparent feedback, and iteration. Participants are encouraged to build off of others' concepts, collaboratively share insights, and refine their concept prior to final submission, by leveraging the shared resources and OpenIDEO Challenge team. In the Submission Phase, we are calling on our global community to submit current innovations focused on the Challenge topic: harnessing technology to bring quality in immunisation services to mobile urban populations, reduce outbreaks and improve primary healthcare. Proposals will be accepted until 5:00 p.m. PST on Wednesday April 10/ 1:00 a.m. CET on Thursday April 11. Proposals are due Wednesday April 10, 2019 at 5:00 p.m. PST/ 1:00 a.m. CET on Thursday April 11. Submissions are reviewed by a panel of expert Judges, our Sponsors, and OpenIDEO to select Pacesetter Finalists. Proposals on the platform will lock during this review period, though we encourage you to leave and respond to comments, feedback or insights that may fuel idea development. During our final evaluation period, shortlisted submissions will be reviewed by Gavi INFUSE, the rest of the Gavi secretariat and the OpenIDEO Challenge team. We will narrow down to a smaller list of proposals for deeper diligence, before announcing Pacesetter finalists in June 2019. Final Review will occur from April 11, 2019 until early June 2019. Stay tuned for the announcement of our Pacesetter finalists, who will be invited to an in-person workshop to collaborate, pitch and receive expert feedback on their concepts. Selected concepts will be announced and invited into the finalist Pacesetter community. Pacesetter Finalists will be announced in June 2019. Innovation for Uptake, Scale and Equity in Immunisation, or INFUSE, aims to identify proven solutions which, when brought to scale, have the greatest potential to modernize global health and immunisation delivery. INFUSE was launched by Gavi, the Vaccine Alliance, at the World Economic Forum’s 2016 Annual Meeting in Davos. Every year, INFUSE calls for innovations that can help Gavi, governments and partners to reach more children with life-saving vaccines. INFUSE then works with expert partners to select the most promising innovations and “infuse” them with the necessary capital, expertise or other support needed to bring them to scale. INFUSE aims to accelerate the speed at which developing countries can gain access to and scale up appropriate technologies to strengthen health systems. In 2019, INFUSE is looking for innovations uniquely positioned to address immunisation challenges in urban settings. Ensuring that all children and families are reached by health services, tracking children through their course of vaccines, delivering high-quality immunisation services and improving disease surveillance are all vital to preventing and detecting outbreaks in densely-populated urban settings. In 2018, 55% of the world’s population lived in urban settings. By 2050, this figure is expected to rise to almost 70%. This rapid growth will add nearly 2.5 billion people to urban areas, with 90% of the expansion occurring in Asia and Africa*. These large, congested urban settings—with their often mobile, transient and underimmunised populations—are particularly at risk of disease transmission and outbreaks, such as yellow fever, cholera and typhoid. Inadequately built, densely-packed dwellings, unchecked informal developments, poor infrastructure and sanitary conditions, and frequent travel between urban and rural settings all have the potential to quickly transmit life-threatening diseases. This carries an additional economic cost to countries. According to World Bank estimates, the annual global cost of moderately severe to severe pandemics is roughly $570 billion, or 0.7% of global income. Improving routine immunisation in the urban population is an essential component in addressing immunisation coverage and equity. Today nearly 6.4 million, or 40%, of the 16.1 million under-immunised children in the 73 Gavi-supported countries live in cities, and the proportion continues to increase. Gavi’s mission is to ensure that every child is immunised with basic life-saving vaccines no matter where they live. It is clear that the specific challenges in urban environments—which affect health workers, program managers and caretakers alike—require more innovation in order to ensure that every child is reached. High mobility: Urban residents, particularly those living in informal settlements, are on the move. The high number of migrants in urban settings, including the almost 60% of refugees that live in urban areas across the globe, change residence and seek healthcare across different public and private facilities. Insufficient services: Due to rapid or unrecognized growth in and around major metropolitan areas, services have not kept pace with the growing population. Immunisation services are not alone in this—water, sanitation and primary healthcare interventions are often absent from urban poor communities. Assuring that data on the population and their needs is made available is critical to designing programs and advocating for investments to improve access to primary healthcare and to pave the way for universal health coverage for other services. 3) continuously monitor progress of urban programs, ensuring targeted and continuous high-quality immunisation services. In 2019, INFUSE is looking for innovations uniquely positioned to address immunisation challenges in urban settings. 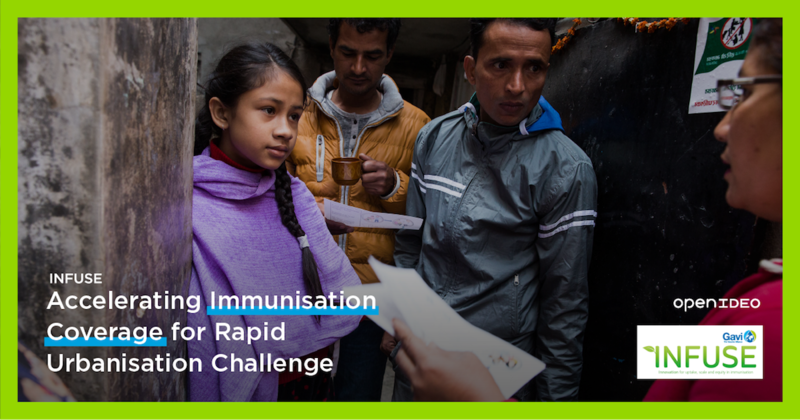 Through this Challenge, Gavi is seeking innovations that aim to address the following challenges in assuring that children living in urban areas are reached with immunisation. Identification and tracking of immunisation services received by children in highly-mobile, urban populations to allow for effective coverage and completeness of immunisation service delivery, as well as improve the availability of real-time immunisation data for evidence-based decision-making (e.g. mapping of informal residential areas, and immunisation and disease surveillance data from public and private facilities). Service delivery design that is responsive and targets underserved populations in urban settings, including by addressing gender inequalities in immunisation coverage (e.g. innovative payment schemes for hard-to-reach areas, mobile service delivery outlets, and demand generation tools for immunisation). The progress of urban programs should be monitored through platforms that promote the use of data by program managers and communities (e.g. health worker tracking and caretaker quality of care reporting). Submissions are welcome from registered nonprofit, civil society, community-based, and for-profit organizations working in any country and territory in the world. Participants must be serious about advancing their solution beyond the Challenge, and be beyond the piloting stage of their program/product/service. If your innovation is at the prototyping stage or earlier, please contact our Challenge management team about other opportunities for early stage funding at: infuseurbanimmunisation@ideo.com. Although applications from any country are accepted, please note that Gavi currently focuses in and targets specific countries to strengthen urban immunisation programs. They are especially excited to see submissions from these countries and regions. An overview of Gavi’s urban immunisation related efforts, and their countries of focus, can be found here. Technical experts and industry leaders will review submissions based on their proven ability to accelerate, improve, upgrade processes and service delivery across the immunisation value chain, accelerating coverage and equity in immunisation; the extent to which they have considered cost-effectiveness, potential time to scale, level of impact, evidence base, strength of business model and the team, and adaptability. Solutions that have originated in a developing country, have track records with respected public and private partners, can be replicated in at least French and English speaking countries, and are sensitive to issues of gender empowerment and environmental challenges are encouraged to apply. INFUSE is not seeking early-stage innovations for research or pilot projects. To be successful, an innovation must have advanced beyond the pilot stage and be capable of being deployed at a large scale within six to twelve months. For information about our submission criteria, please see below. If you have questions around the submission process, or the Challenge in general, you can contact us at infuseurbanimmunisation@ideo.com for more information. Unfortunately, we are only able to evaluate proposals in English and French. If submitting in either of these languages is not possible for your team, we ask you to submit earlier, and send a note at infuseurbanimmunisation@ideo.com for additional support. Although we cannot promise capacity to read and evaluate in other languages, we will do our best to provide the necessary support! Through the INFUSE 2019 challenge selected innovations will be invited to join the INFUSE Community, an ecosystem of leading innovators, corporations, and development partners tasked with collaborating together to bring greater innovation to the immunisation and global health space. The most promising of these innovations will be designated as INFUSE Pacesetters and will receive focused support from Gavi and its partners with the potential of being taken to scale in interested Gavi supported-countries. By applying to INFUSE, selected Pacesetters are entering a community of high-potential innovators and the opportunity to closely work with the Gavi Secretariat to accelerate and scale their innovations. With the INFUSE program the selected Pacesetters will benefit from the Gavi Alliance-wide network as well as its expertise in global health. INFUSE offers a unique opportunity to work with Gavi in securing the resources and expertise needed to scale. Selected INFUSE Pacesetters will have the opportunity to work with Gavi to develop a plan for accelerating and scaling their innovations in Gavi countries. Pacesetters can expect interfacing with Gavi Secretariat to better understand how to adapt innovations to expressed country needs. Most promising Pacesetters might also receive interest from Gavi’s private sector partners with respect to potential for collaboration and partnership. INFUSE Pacesetters will be assigned a dedicated Relationship Manager who will support Pacesetters in navigating Gavi’s network and mobilising funds and resources. INFUSE Pacesetters can also expect to be featured in Gavi’s website and potentially in other networks globally. We encourage you to use our toolkits and resources to improve and refine your submission prior to the final deadline. Regardless of the stage of your innovation or organizational maturity, we believe that the design thinking framework can be used to improve important aspects of your work and proposed innovation. Use the Storytelling Toolkit to refine your narrative so that it more appropriately resonates with investors, potential investors, of the implementation community. Use the Prototyping Toolkit to test a small piece of your innovation, iterating to improve the product design or efficacy of implementation. Use the User Experience and Feedback Toolkit to revisit beneficiaries and in-country context, improving service design and strengthening the context relevance of your proposed solution. Gavi, the Vaccine Alliance is a public-private partnership committed to saving children's lives and protecting people's health by increasing equitable use of vaccines in lower-income countries. The Vaccine Alliance brings together developing country and donor governments, the World Health Organization, UNICEF, the World Bank, the vaccine industry, technical agencies, civil society, the Bill & Melinda Gates Foundation and other private sector partners. Gavi uses innovative finance mechanisms, including co-financing by recipient countries, to secure sustainable funding and adequate supply of quality vaccines. Since 2000, Gavi has contributed to the immunization of more than 700 million children and the prevention of over 10 million future deaths. Learn more at www.gavi.org and connect with us on Facebook and Twitter.